The Sony Xperia SP comes with the OfficeSuite 7 viewer. OfficeSuite 7 lets you view almost any type of document, although you'll have to buy the Pro version if you want editing capabilities as well. There's a Notes app that comes with the Xperia SP. It's pretty simple to use - you can select the color of the note and just start typing or doodling. There's also Evernote integration. The Power Saver setting helps you extend your battery life by toggling things like Wi-Fi, GPS, Bluetooth screen brightness, auto sync and background data on and off automatically when the battery charge falls below a certain user-defined threshold, turn off the Wi-Fi if there is no saved Wi-Fi network in range or turn off the mobile data when the screen is off. The Calendar also pulls info on upcoming events from your Facebook account. Facebook events appear just like regular calendar entries, except that you can't edit them from the app. There is a nicely touch-optimized calculator aboard. The buttons are really big and easy to hit, and it also offers advanced functions (trigonometry, logarithms). The clock app supports multiple alarms, each with its own start and repeat time. There's also a desk clock option, although it doesn't have integrated weather or news information. The stopwatch, world clock and timer are available within the clock app. The Timer function now has a history option, and the world clock features a cool slider which helps you quickly figure out the local time in another city. If you're looking for even more organizational options, the Google Play store is full of free apps that can cater to all your needs. 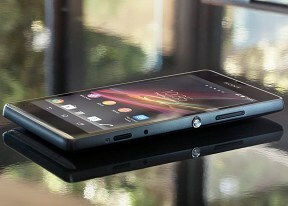 The Sony Xperia SP comes with a GPS receiver, which took about a minute to get satellite lock upon a cold start. You can use the A-GPS functionality to get near instantaneous locks. Alternatively, network positioning will also do if you only need an estimate of your location. The Xperia SP comes with Google Maps and Navigation. Voice-guided navigation has become a viable solution since the v5.0 update. Vector maps are smaller and easier on the data traffic and reroute is an option if you go off course without the need to connect to the Internet. In fact, the only time you need a data connection is when you initially plan the course - Navigation will cache the needed maps. Google's app uses vector maps, which are very data efficient. The latest version has an easy to use interface for caching maps - you just choose "Make available offline" from the menu and pan/zoom around until the desired area is in view (there's an indicator showing how much storage caching that area will take). You can later view cached areas and delete ones you no longer need. Note that there's a limit to the size of the area you can cache - you can't just make all of Europe available offline, not even a whole country. We managed to cache London and parts of the surroundings before Maps told us the area is too big. There's no address search either in the cached maps and you can only cache map data in supported regions of the world. If Google Maps Navigation doesn't do it for you, you can grab another from the Android Market - there are both free and paid alternatives. Wisepilot is also part of the Sony Xperia SP package, with a navigation license for 30-days and downloadable maps for offline navigation. You need to pay extra to continue using the app once the trial expires. Unfortunately it was not working on our unit due to some incompatibility with the Android version. Running Android Jelly Bean, the Xperia SP has access to the latest apps and the microSD-expandable memory guarantees you won't have trouble with storage space.